There is something about cool weather and nice slice of home baked bread slathered with fresh apple butter. The easiest way for me to make it is to use my other half, my slow cooker. The aroma that fills the house is unbelievable. Not quite the smell of apple pie but still fragrant. Put all of the ingredients in the slow cooker, cover and cook on high for 1 hour, stirring occasionally. 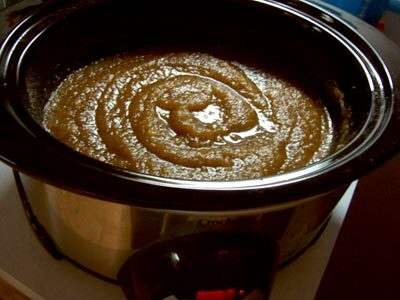 Set your slow cooker to low and let it cook for 9-10 hours, stirring occasionally. Once it has turned a nice, rich brown color remove the top and cook uncovered for 1 hour. Stir with a whisk to make it smooth. You can spoon it into jars to refrigerate or containers for freezing. **Note*** I will skip the last hour of uncovered cooking, spoon into canning jars to can and keep in the pantry.